Apple updated their App Store Distribution page yesterday to note 68% of iOS devices are now running the latest version of their mobile operating system, based on App Store usage of of January 5, 2015. 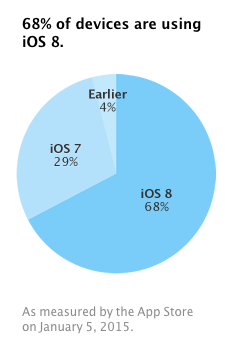 In just under a month, iOS 8 adoption increased 5% compared to the previous update on December 8, 2014. After a slow start, iOS 8 installs have increased after updates were released to fix earlier bugs, while the requirement to use Apple Pay in the U.S. also required users to install iOS 8.1.